The thesis is that the 1% will compound capital from here at such a rate as to take all the cash and leave the 99% with little. The underlying assumption seems to be that compounding large pools of capital over long periods of time is straightforward and low-risk. First question: If that’s true, shouldn’t national pension programs like US Social Security be immediately privatized and invested the same way to receive the twin benefits of harvesting great capital compounding opportunity for the benefit of 99% and also suppressing investment returns of the 1%? Piketty walks up to this conclusion and then backs away, apparently because that would be too risky for long-term retirement assets? But if it’s that risky for e.g. the Social Security pool, isn’t it also riskier than he says for the 1% investing their own capital? Note that the investment approach for Social Security could be to invest the entire pool like a university endowment, not individuals investing their own cash. Second, if capital compounding will work so well for the 1%, isn’t that result of a world awash with opportunities to productively invest capital? Isn’t that world the opposite of the “secular stagnation”/”innovation is dead” world so many economists believe we are in? Isn’t that world one that is fantastic for consumers who benefit from all of the resulting innovation and technological progress? Wouldn’t Piketty’s prescriptions suppress that hypothetical scope and rate of technological and material progress? 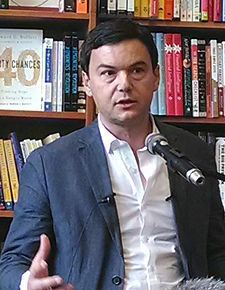 So is Piketty therefore proposing that the 99% be made worse off absolutely in order to be better off relatively? Will the 99% be consulted at any point as to which of these scenarios they’d like to see play out? Or is the theory that liberal technocratic economists in Paris and places like it get to make those decisions on behalf of the 99%? @malmutla Not true, disruptive ventures are raising more money than ever before, not less. See Facebook, Tesla, many others. @binarybits Think about it the other way around.